The National Weather Service has issued a blizzard watch for much of eastern Massachusetts ahead of what's forecast to be a major nor'easter. The watch is in effect from Friday morning through Saturday afternoon. 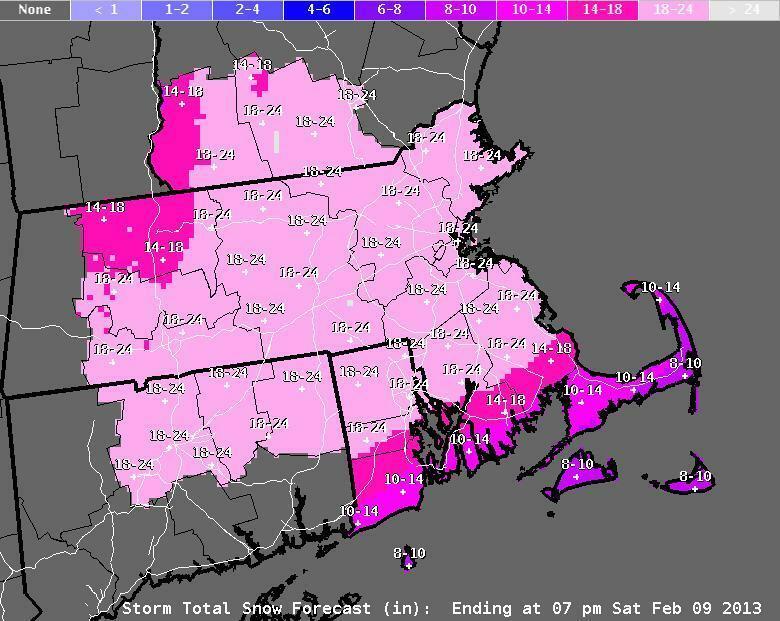 According to the weather service, the storm is expected to drop 1 to 2 feet of snow across much of the region. Meteorologist Mark Rosenthal said he expects the snow to start sometime after dawn Friday, and pick up just in time for the Friday evening commute. "Friday afternoon is gonna be a real nightmare," he said. "Snow's gonna be falling at a pretty good clip, the winds are gonna be picking up from the Northeast at 30 to 50 miles per hour, and the worst part of the storm, I believe, will be Friday night through much of Saturday." In its alert, the weather service adds that "travel may become nearly impossible with blowing and drifting snow" during the worst of the storm. Boston officials say they're preparing for the snow. "We'll be monitoring the snow reports almost on an hourly basis to make sure that we are ready when it comes," Mayor Thomas Menino said. "We'll have our public works department out there, but we'll also have our private contractors we'll bring into the situation." Peter Judge, of the Massachusetts Emergency Management Agency, says people should stock up on supplies. "Power outages will be an issue," Judge said. "So that's something that people should be considering, taking steps right now. 'Am I ready if I lose power for a number of days?' "
NStar spokesman Mike Durand says the utility is preparing its entire workforce to respond to outages. "We have 3,000 employees and all of them are keenly aware that when this type of storm comes in, they can, and likely will, be called into service," Durand said.